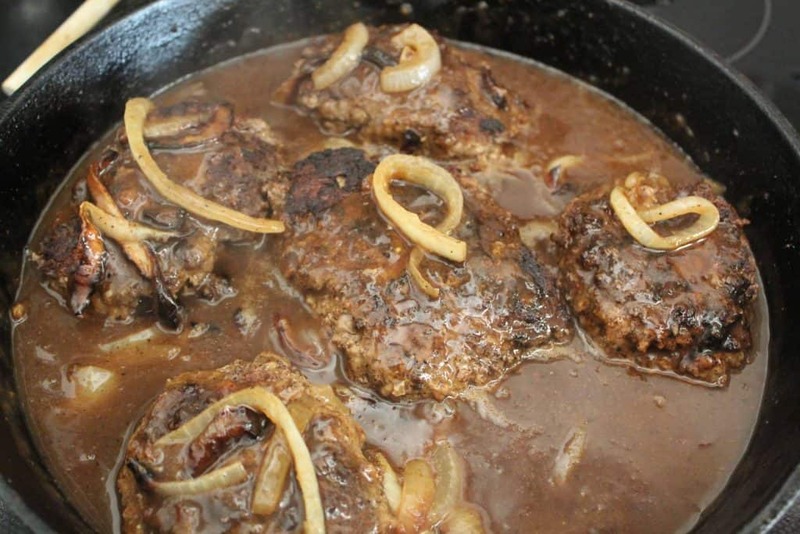 Salisbury Steak is a comfort food and is usually served with mashed potatoes. The dish itself was developed by Dr. James Salisbury in the 1800’s. His story is interesting and you can read about him here; in short, he was an early proponent of a low-carb diet and believed that his signature dish was a cure for many ailments. This intermediate level recipe uses lean ground beef, sauteed onions, and savory seasonings; it is considered intermediate only because the onion sauce and meat are cooked simultaneously. You can cook the onion sauce first if it’s easier for you. Two pounds of ground beef turned out about six steak patties, but I’ve gotta tell ya’, my husband ate three and my kid ate two, so…if your guy is a meat and potatoes type, plan on using at least two pounds of beef. 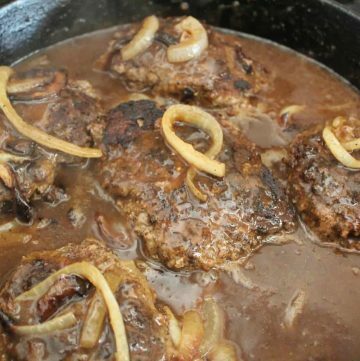 What Type of Ground Beef Should I Use for Salisbury Steak? You’ll want to use a lean ground beef because if you use a fatty beef, the steak patties will shrink! I prefer ground sirloin, but if it’s not available or too pricey, I use a beef that is 80-93% lean. Can I Use White Onions Instead of Yellow Onions? Yes! This recipe works with sweet yellow, yellow or white onions. Can I Use Flour Instead of Corn Starch to Thicken the Sauce? Yes, but keep in mind that flour thickens at LOW temperatures, whereas corn starch thickens at HIGH temperatures. If you elect to use flour as a thickening agent, just turn the heat on the broth to low, then add the flour and whisk, strain, etc. Can I Make Salisbury Steak in Advance? Yes. After you make the steaks and sauce, store each separately–steaks in one container, sauce in another. When it’s time to reheat, place the steaks in a baking dish covered with foil and bake at 350° F until steaks are thoroughly heated. Reheat the sauce on the stove; note, you might have to add more broth to the sauce as it tends to thicken or gelatinize when refrigerated due to the starch (flour or corn starch). 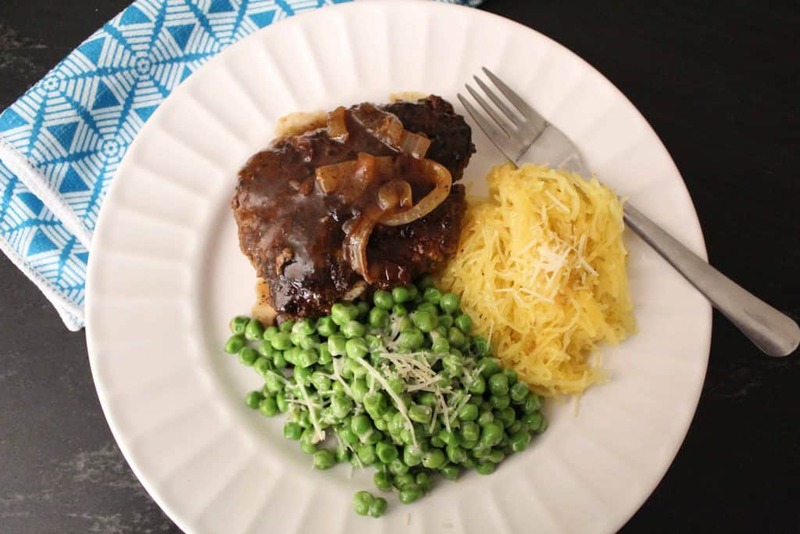 Serving suggestions include Parmesan Peppered Peas and Spaghetti Squash! Seasoned ground beef patties topped with a savory onion sauce. This recipe is intermediate level due to the fact that you're cooking two things simultaneously. If it's easier for you, cook the onions and sauce first, set them aside, then prepare the steaks. Mushrooms are a nice addition to this recipe; simply add sliced mushrooms in with the onions. If you use corn starch as a thickening agent, add it and bring the heat UP. If you use flour as a thickening agent, turn the heat DOWN to low, then add the flour.